A77X, Active Monitor from ADAM in the AX series. ADAM will introduce its A77X monitor at Musikmesse. Like all models of the AX series, the A77X features the ADAM proprietary X-ART tweeter. The 'X' stands for 'eXtended frequency response' and thus for one of the features of the Accelerating Ribbon Technology that has been improved, according to the company: the frequency response. It now extends all the way up to 50kHz. 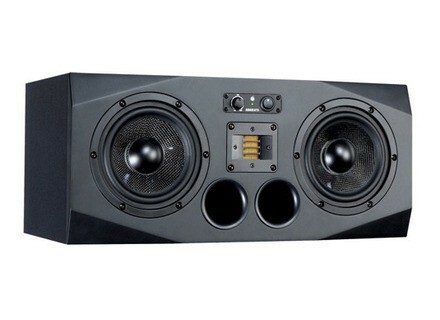 The two 7" woofers are identical with that of the A7X. Their voice coils are 1.5". The woofers do not cover the same frequency bands: while one of them is responsible for the (sub-) bass frequencies up to about 400Hz, the other takes over most of the midrange, ADAM explains. The rear panel features several additional controls: a gain for the high frequencies (± 4dB) and two shelf filters for high and low frequencies. There are both XLR (balanced) and RCA (unbalanced) connectors. The A77X will be showcased for the very first time at the Prolight+Sound (Musikmesse) 2011 (Frankfurt am Main/Germany), at booth C51 in Hall 6.1. For more details and full product specs, head this way. [Musikmesse] Focusrite Control 2802 Focusrite and Audient announce an agreement whereby Focusrite will commence the production and sale of certain Audient product designs. The first product to be released under this agreement is the Focusrite Control 2802 Dual Layer Mixing Console. AETA Audio Systems 4MinX Aeta Audio will show its 4Minx multitrack recorder/mixer at NAB Las Vegas. Genelec 1238CF The Genelec 1238CF is a three-way DSP monitoring loudspeaker including drivers, multiple power amplifiers and digital signal processing (DSP) circuitry.